At times, there will be people who will act stupidly, or they will have stupid vices. However, making fun or these stupidity or vices directly and outright is considered rude or mean. Hence, this need lead to the development of literary devices such as sarcasm and satire. Satire is a genre of literature that uses humor to ridicule, expose and criticize the vices, follies, abuses, and shortcomings of others. This is not done just to make fun of something, but also with the intent of shaming individuals, corporations, government or society itself, so that they may improve. 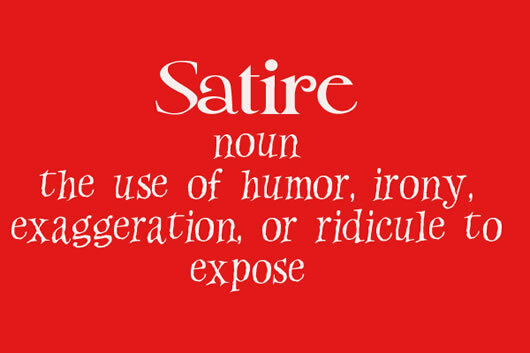 Satire often makes use of irony, derision, or wit, in order to achieve its goal of shaming people, organizations, religious sects, and society to improve. Users of satire believe that by exposing these follies, and disgracing them, they will hopefully see their own follies and improve. The term, satire, can refer to act of shaming, to the work in which the object is being mocked, or to the genre of such work and literature the utilized satire. Works in which satire can be used are infinite, and can include books, novels, non-fiction, articles, plays, art, paintings, cartoons, etc. It is often used by contemporary artists to criticize contemporary politics and other current issues.